Vusi’s Adventure – The Pirate Captain. His hoof struck sparks where he pawed the ground. He tossed his head reveling in the feel of his mane on his muscular neck. Nostrils flared and eyes red with excitement. Tensed, his body filling out his broad chest, he contemplated the unknown shimmering light that hovered before him. Across the African plains they roamed, fiercely independent, proud and brave. They feared nothing. Neither the packs of lions that regally walked the plains, nor the terrifyingly swift cheetah that ran alongside them in a test of stamina, agility and speed. Zebra considered themselves the luckiest of animals. None more so than Vusi (pronounced /voo-see/, and means “to lift up”) who, standing tall and strong, saw himself as the leader of the Zebra herd. Being only two summers old, Vusi had to work hard to stay at the front of the herd when they raced through the grass, making sure he kept his senses tuned to weaker Zebra’s that may fall back and become prey for the lions, leopard and hyena’s which hunted them. When this happened, Vusi would crash his shoulder into the leg of the Zebra next to him forcing the herd to turn and any hunter would be confronted with a stampeding herd of flashing sharp hooves and teeth. Vusi loved to stand off to one side of the herd, while they gently cropped the grass or took succulent new leaves from the bushes, and let his eyes roam over his friends and family. A true leader he instinctively knew where the weakness and strengths of the herd were and could direct them to a shrub that would settle an upset stomach, or a patch of grass where herbs grew that would help strengthen a weak leg. He would spend hours with the older Zebra, his body pressed against them giving them comfort as they told him the tales of his ancestors and secrets about where to find water and food for times of drought, stories that he would need to pass on when he was old. It didn’t worry him that they would be taken from the herd, understanding that as the circle of life moved, their place would change from running across the plains to running across the sky as the stars that shone down, and comforted, him every evening. Vusi did have one wish, and that was that Zebra’s could have something that would make them totally unique. Elephants towered over them, their trunks swinging between curved pillars of ivory. They were Vusi’s favourite animals, and he admired the way they looked out for each. Rhinoceroses had plates of armour and a huge horn. Cheetah and Leopards had spots. Lions manes and the tortoise a hard shell. Wildebees and Buffalo proud horn bosses. Giraffe’s long legs and necks, but the Zebra, for all his proud ancestors, was indistinguishable from horses. Vusi knew in his heart that they were not horses, ponies or donkeys, but Zebra, proud, independent and brave. At the waterholes where they met other animals Vusi was always asking for the stories about how the leopard got it spots, or the elephant its trunk. Stories, any stories, were his favourite thing, but he hoped that these stories would help him in his quest to discover how the Zebra could become one of the unique animals of the plains. Most of the animals ignored Vusi as he made his way between them. A few would ask for his help about something that was bothering them, or to ask if he discovered anything special today, but most didn’t know anything about what he was looking for. Strangely, perhaps, the companions who gave him most of his information were the black and white Pied King Fisher birds that chatted ceaselessly as they flitted around the waters edge. Vusi called them the Pirates, their black and white patterns reminding him of the Pirates flag, the Jolly Roger. From their vantage points hovering above the water they heard all sorts of gossip, which they gladly shared with anyone who would listen. Vusi was a keen listener! The rising sun was a bright red orb in the sky, but already the dust hung across the waterhole as the herd moved down to drink. It was a dangerous time for the Zebra as their companions the Wildebees were still drowsy with sleep and lions loved to hunt at this time when their camouflage enabled them to stalk close to the herd. There was a great deal of snorting and barking by the Zebra lookouts as they searched the grass for signs of danger. Vusi lowered his head to drink watching his reflection in the water. He crossed his eyes trying to see how much he had grown since last night and barely caught the darting shadow moving across the water towards him. The Pirates chattering seemed especially noisy this morning and Vusi felt a thrill of excitement run down his back wondering what new information they had heard about. With the Pirates whizzing about his ears, Vusi walked back through the herd ignoring the smirks directed at him from older zebra that couldn’t understand why he spent time with the chattering birds. He found a spot atop a grassy knoll, with a tree close by for the birds to settle in. Not too far from the water so they could fish whenever they wanted, yet gave him a good variety of grass, roots and berries for his breakfast. Best of all, he was now at almost the same height as full-grown Zebra, as befitted a leader. Vusi grazed as he listened to the Pirate’s news. He had become good at piecing together the story from the scraps, which were jumbled with the constant bickering that went one between the birds. His initial excitement waned as the Pirate’s couldn’t seem to agree on anything they wanted to tell him. There was something bright sitting on the plain near the big baobab tree. But it couldn’t always be seen and didn’t smell like any animal they had encountered before, which was impossible because they knew everything. Even more strange, was that it had spoken to the Pirates in their own language, something most of the other birds couldn’t do and certainly not another animal, not even Vusi. The herd having finished drinking, began to move past Vusi’s knoll and the Pirates took off promising to tell him more when he came back that evening. Vusi shook his head and rushed down to be at the head of the group as they looked for shade to protect them from the heat of the sun. Walking along, stopping to nibble at succulent new shoots, he tried to make sense of what he had heard from the Pirates. He hadn’t heard of anything that could speak to the Pirates. Being young, the Pirates could understand his emotions, and he had learned to understand their chattering by spending so much time with them. But it was unusual and he didn’t think any of the other Zebra could understand them. What of the bright light? Vusi knew about the sun and the moon, which when reflected off stones and pools of water hurt the eyes. Could this be a reflection? That would account for why it was sometimes there and sometimes couldn’t be seen. It must be, and he felt very pleased that he had worked out what it was the pirates had seen. To test his idea Vusi looked for a pool of water near the trees they were heading for, but it was the dry season and there was very little water apart from the waterholes. Did baobabs store water he wondered? Vusi went a found one of the old Zebra who was standing daydreaming with the sun warming his back and asked about baobabs and whether they could store water? He settled down to listen about these wonderful trees that grew to 6 000 years old and were a source of nutrients and herbs and loved by elephants. And, yes they store water in the fibers of the tree and in great hollow’s created in its limbs. Most of these were too high for zebra’s to reach as the trees grew to terrific heights. It could then be water that was dripping out of one of these reservoirs Vusi thought. It could reflect the sun and then be absorbed by the sand till it formed again in the cool of the night. Once more Vusi felt very pleased with himself, and thanking the old Zebra went off to inspect the herd. Walking between the Zebra he again thought of the light that spoke with the Pirates. Perhaps he should go and see if what he suspected was true, rather than assuming he was right. Leaving the herd was a very risky business. As the leader he was responsible for them and a lone zebra on the plains was an easy target for the hunters. Something to be avoided, but moving the herd in the direction of the great baobab would be difficult as there was no water there. Not possible he decided, and feeling weary went and found a spot where he could rest. Vusi woke to the sun setting low over the trees and picked himself up for the afternoon run down to the water. Enjoying the rhythm of his hooves drumming against the ground, Vusi felt he could run forever. Slowing as they neared the water hole the herd waited for the Wildebees to go ahead and minimize the danger from hunters. As he hoped, the Pirates were waiting and came to him eagerly to tell them what they had discovered since they last saw him. The Pirates had been out top the big baobab and had seen the shimmering light and had heard it talking to them. There was quiet a collection of plains animals at the tree. The shimmering light had told them that there was a task that needed to be done, which would bring great honour to the chosen animal. The Pirates were so excited that they had found what Vusi was looking for and he must follow them before some other animal decided to accept the task. No, they didn’t have any idea what the task was, and yes leaving the safety of the herd would take great courage, the Pirates responded to Vusi’s unspoken concerns. They would go all the way with him and warn him of any danger from hunters long before they would sense Vusi’s presence. Now, now they trilled to Vusi, while everyone is busy drinking, we have to go now or they wouldn’t get to the baobab before it was dark. Vusi looked about noting that everyone was intent on drinking and weren’t watching him. He moved off towards the edge of the herd the Pirates, darting about, distracted the Zebra that was standing guard. Vusi ducked between two bushes, his brown skin concealing him easily, and looked about for his friends suddenly feeling very alone and vulnerable. Chattering drew him towards a clump of trees and there he found the Pirates sitting on one of the branches. As soon as they saw him, they flew up and headed towards the setting sun, with Vusi following closely behind. The sounds of the plain, which he had always enjoyed, seemed hostile and a shiver ran through him; being away from the herd was very frightening. Fortunately, the ceaseless chatter of the Pirates distracted him away from his fear and Vusi began to enjoy the adventure of being out. He realized he was very far from being alone. Graceful Impala were grazing contentedly and the Ostrich’s intricate dance was creating dust plumes turning the sun’s rays a rich red. Vusi began to run as the Pirates were moving quickly and as he went he kept looking around, identifying landmarks he could use when he wanted to return home. Vusi had been past the great baobab before, but he didn’t know how far it was from the water hole, and he looked anxiously at the setting sun, wondering what he would do when night arrived. The pirates were flying low and straight, their growing concern with the swiftly arriving darkness evident by their lack of noise. Animals looked up briefly at the running Zebra, curious as to what he was doing out alone and berating their youngsters not to be so foolish as to wonder off and get lost. Giant fingers appeared against the skyline swiftly growing into the trunk of a giant baobab and Vusi felt relieved and excited that they had arrived at the tree. He could hear the excited chatter from the Pirates and wondered what was awaiting him. As the Pirates had mentioned, there seemed to be an extraordinary large number of animals around and Vusi was forced to walk between them as he got closer. He could see that there was a definite glow from the side of the tree, which could not be the sun reflecting off water as he had thought because the sun was now very low in the sky, a red ball of fire close to the horizon. It wasn’t like anything he had experienced before and none of the stories he had been told matched the pulsing disc of light. Vusi moved forward drawing away from the circle of animals that surrounded the tree. Despite the silence he didn’t feel afraid and there was definitely some sort of voice calling to him. He stamped his foot, raising a cloud of dust, looking up to see if he could see the Pirates in the branches of the baobab high above him. But the tree was in darkness and only the faint sound of their chattering floated down to where he stood. The light around Vusi grew brighter, began to swirl and he had to turn his head away from it feeling himself caught up as though in the middle of a giant dust devil. Vusi couldn’t measure how long he spent in the twisting cone of light, but when it moved past him he couldn’t recognize any of the landscape around him. It smelt different to the plains and Vusi felt the fear rise up in him wondering where he was. He looked around hoping to see the Pirates or any of the herd. In the distance Vusi could see a mountain rising like a cone to the clouds. The ground under his feet was very green, lush grass the colour of the freshest spring shoots. He bent his head and nibbled at it and was amazed at the taste which filled his mouth. Never had he eaten anything that tasted so wonderful and gazing around him in amazement Vusi wondered where he was, or what had happened to the plains and all the animals. A flash caught his eye, and Vusi turned to see what it was. A drop of water, was caught on the end of a blade of grass, a jewel which danced before him. Vusi walked towards it noticing that the there were more drops, a pathway though the grassland. Feeling thirsty, he dipped his head and sucked up the drop of water. It seemed to explode in his mouth filling his body with energy and vitality. Amazed he looked for another drop, but the pathway of water drops had disappeared leaving him in the middle of a sea of grass. Startled Vusi turned in case he had misjudged where the next drop was, but there was nothing to see. Full of energy he decided to walk towards the mountain on the path he remembered the drops of water showed through the grassland. A Zebra, he knew, had a very good sense of direction. Two shadows raced towards where he was standing and Vusi was overjoyed to see the Pirates. They flew around his head urging him to follow them. Puzzled, Vusi looked at the direction the Pirates were leading him. This wasn’t the direction the water drops had shown? Turning Vusi began to run after the Pirates. After all, they must know the way to the Rain Goddess; they had been his guides before. On he ran, the grass swishing under his hooves, the trees a passing blur as he fought to keep the chattering birds in sight. Vusi began to tire from the swift chase and as quickly as they appeared, the Pirates vanished. Alarmed he slowed, anxiously searching for any sign of his friends, but there was only the grass stretching in every direction. Vusi’s legs began to tremble with the exertion of the run and in fear. He was lost. Fear was a new sensation for Vusi; Zebra’s are fearless, yet he knew that he was lost without any idea of where he was, or where he should go. Vaguely he remembered what the light had told him. He must trust his heart and follow the trail. The trail had disappeared but when he turned around there was a direction that felt right. He kept turning slowly in a circle waiting for the feeling to return and when he felt it he started to walk in the direction that felt so right. As he walked he nibbled at the grass, growing in strength as he ate. His spirits began to lift and he tried to make sense of what had happened. Perhaps whoever had stolen the Rain Goddess was trying to misdirect him by sending what looked like friends to lead him away from the correct path? Vusi looked around for something to drink. The long run and the food had made him thirsty, but he didn’t know where a watering hole was. A clump of trees beckoned to the thirsty Zebra, and Vusi felt himself drawn towards it, away from the direction that felt right. He knew that water was life and without it he would not survive for long. Ignoring the feeling of the path, Vusi turned towards the trees running down to where there was the promise of water. It didn’t seem to matter how swiftly he ran, the trees didn’t get any closer and again Vusi felt panic rise up within him. What was happening, it couldn’t be that far away. How would he survive without water? He stopped, his chest heaving, sweat running down his neck, and turned once again in the direction that felt right. Vusi walked for hours, his head drooping as the effects of dehydration started to affect him. He looked for trapped bits of moisture under leaves, remembering all the stories the elephants had told him about finding water. He looked for plants that had tubers buried under the surface, which would hold water but there was only the grass, beautiful green grass that tasted better than anything he had ever eaten, but without water would not keep him alive. He didn’t know how long he walked before he noticed a dim sparkle in the grass. Looking up with eyes red from fatigue the pathway of water drops sparkled into the distance. Vusi knew that if he drank one drop the pathway would disappear and he was not sure that the direction that felt right was the same as the one the drops were leading him in. Ignoring the thirst raging through him, he followed the line of drops, which grew brighter the longer he followed them. The grass stirred and Vusi became aware of a song coming from somewhere ahead of him. He didn’t feel quite so thirsty or as weary and the drops of water changed colour with the music, calling him onward. Vusi began to run, with renewed urgency. The song, which gave him energy, began to fade as a new sound grew louder, that of rushing water. Vusi slowed as he approached the bank of the river. Below him, the brown waters tumbled and he looked across the wide, swiftly flowing river to the far bank, where he could see the glint of water drops. He had heard stories of the great migration that crossed mighty rivers full of crocodiles but he couldn’t see how he could possibly cross this torrent of water. Even as he watched the water seemed to flow more swiftly and angry whirlpools sucked debris deep into the river. Vusi walked up and down the bank of the river looking for a way across and each time he returned to the spot opposite the drops of water, they seemed to fade more. A Zebra is proud and brave, Vusi thought, as he ran towards the edge of the riverbank and threw himself out and down towards the water. His stomach lurched as he dropped, his feet clutching at the air; he plunged into the water, the force taking his breath away as the water closed over his head. Spluttering Vusi fought to stay afloat as the rivers current caught at him and tried to drag him down. He pawed in desperation at the water, his eyes rolling in his head as he fought for any kind of purchase in the raging torrent. His strength fading quickly, Vusi felt himself slide back under the water and with only his nostrils above the surface hope faded. Vusi squealed as sharp teeth closed around his leg and from somewhere found the strength to leap away from the jaws of the crocodile. Frantically his legs kicked out, his sharp hooves the only defense against the crocodiles that moved into attack him. He had no idea where the bank was, but knew that he couldn’t give in now. He plunged forward wondering where the next attack would come from and was astounded when his foot found the bottom of the river. With joy in his heart, Vusi pushed his legs into the sand and powered his way out of the water looking back to see the crocodiles gliding swiftly towards him. The steep bank was before him, but fear of the crocodiles gave him the strength needed to reach the top, where he stood trembling. Vusi looked around to see if he could determine how far the water had carried him down stream and was amazed to find the water drops dancing next to his foot. Across the river he could see where he had jumped off the bank, the river no longer a torrent, glided lazily between the banks. There was no sign of crocodiles but the marks on his leg were a vivid reminder of the battle he had been in. Slowly he began to move along the pathway towards the mountain wondering if he would ever reach the Rain Goddess. Following the drops of water, Vusi could here the song again and he quickened his pace in response to the urgency that the song spread through him. Across the grass he raced, his mane streaming, hooves drumming an urgent tattoo of their own. Ahead Vusi could see a brightening in the sky, was he approaching the Rain Goddess he wondered? But something was wrong with the light. It seemed to flicker and the sky was no longer blue, but grey and black. He slowed to a walk and the now familiar feeling of fear built within him. Vusi had no idea what was ahead of him but he could feel its heat and hear its roaring sound. On the grass beside him the water drops trembled and Vusi watched in awe, as the grasslands in front of him burst into a wall of fire. He turned to flea from this ancient enemy, but it was too late and the as the fire swept down on him, he crouched down in the grass; between the drops of water and felt his skin burn as the flames tore at his hide. His eyes and nose full of smoke, Vusi coughed and coughed as his lungs fought against the heated, smoke filled air. Pain wracked his body from where the fire had burnt him and Vusi felt himself loose consciousness. He dreamed of the light and his assurance that he, Vusi the Zebra, was brave, proud and fierce and would accept the task to find the Rain Goddess. His beloved plains were filled with bones and the sun beat relentlessly on the scorched earth. Faintly he could hear the song call to him and struggling to open his eyes, he realized that he was still alive. Vusi stared at amazement at the sight of his legs. Drops of water glistened against grass that was still green, but his legs were black. Burnt by the fire, except where the drops of water rested against his skin. There white stripes ran up his body. Looking across his back, the same black and white stripes confronted him. He was no longer brown in colour, but a beautiful black and white stripped animal. I’m a pirate, Vusi thought, as he got to his legs marveling at his new look. The insistent urgency of the song made him turn and start back along the trail to the mountain, which seemed to be much closer. Trusting in the direction his heart gave him, Vusi drank from the water drops and with the new life they gave him ran onwards towards the mountain. It rose up before him, the top shrouded in cloud, solid grey walls of rock, oppressive and menacing. The song and feeling brought Vusi to the entrance of a cave closed by a huge stone. It was nearly as big as an elephant and he could see no way that he could move it. The song started to grow fainter and Vusi searched for another entrance to the cave. In desperation he turned and kicked his back legs at the stone with all his strength, but the stone stood there, defiant. As the song faded, Vusi’s strength faded and his body began to hurt where the fire had burnt it. The wound on his leg from the crocodile started to bleed and he slumped to the ground. Again visions of bones piled up under the red orb of the sun flashed before him, and the words of the light came back. “The task will require a heart that is true and selfless. Are you the one?” Vusi struggled to his feet and walking directly towards the stone, he shouted, “I am Vusi, the Pirate, and my heart is true and selfless.” He did not hesitate but continued to walk and when he reached the rock, the song started up again and Vusi passed through where the rock should have been. Drops of water lead him into the cave towards a bright light that shimmered at the back of the cave. He had reached the Rain Goddess, surrounded by bars of light. Tears rolled down her cheeks, falling to the floor, the drops of water that Vusi had followed across the grasslands. The bars seemed to rise out of the ground and extend into the heavens and as he watched they changed shape and colour, a living prison. He tried to remember if he had been told any stories about the Rain Goddess that would help unlock the door to her prison. Walking up to the bars of light, his stripes began to burn and shimmer, and the song grew stronger as he pushed his side up against the bars, the pain almost overcoming him, the stripes on his body the key to the prison holding the Rain Goddess. The light grew brighter and shielding his eyes Vusi walked away from it, out onto the plain beneath the baobab. The chattering of the Pirates came to him. Who was this black and white stripped animal? “The Zebra”, came the voice from the shimmering light. 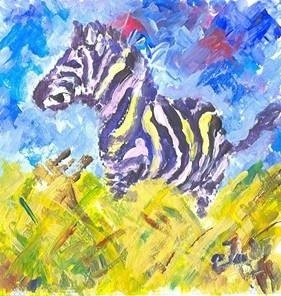 “The mighty Zebra, has the black and white stripes of his trials. The stripes are given to all Zebra by the Rain Goddess, forever a symbol of the key with which the Zebra unlocked the cage of the Rain Goddess”. “Vusi”, the Kingfishers chirped, “is that really you?” He looked up at the whirling birds and thought how much he had missed them and the herd. He started to run, the Pirates darting ahead, along the path, which he remembered to the water hole. As he passed, animals looked up from their grazing, turned to their youngsters and told them that there passed the mighty Zebra in his white and black coat, saviours of the plains. Vusi could see the herd at the water hole and wondered whether anyone had missed him. With the sun setting he passed the Zebra standing watch noting that as he passed, the drab brown colour changed to a vibrant white and black stripe. As Vusi, walked between the herd their colours changed and they jumped about proudly showing off their new stripes. A long time ago in Afghanistan!